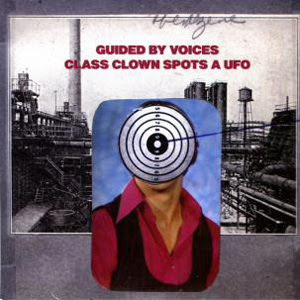 This was the third of the three 7'' singles released off the 2nd GBV reunion LP Class Clown Spots a UFO. It contains two tracks exclusive to the b-side. Limited to 1,000 copies on clear vinyl. Released in the UK on Fire Records. Additional mundane info: a month prior to the official release date of this 7'', all three singles from the Class Clown Spots a UFO series were released in a limited box-set package for 2012's Record Store Day. Class Clown Spots a UFO- Same version as track reviewed under the LP of the same name over here! Message From the Moon- 4 Down-stroked Tobin Sprout pop tune with a serious spring in step. More than tinged with garage, and a sense the whole things about to fall apart. Great little warbled hiccup of a pop tune. Worm W/7 (Home-Fi)- 1- Essentially the demo version of the song "Worm W/7" off CCSAU. Not special, or even worth hearing. Song ends in Suitcase type noise and guitar plucking that none need to hear for any good reason.